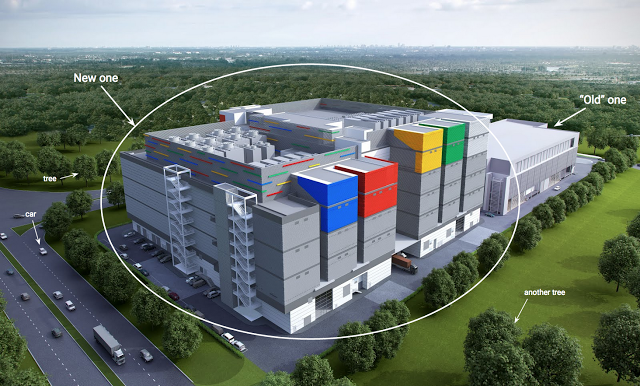 Google launched its first data center in Singapore nearly 18 months ago. Since then, Google says the web and mobile adoption rate has been on a rise. Hence, to meet the forthcoming demand, Google will built another site devoted for the same purpose. The expansion will lead to better performing websites and other web related services. Along with an extension program in Singapore, Google is also said to diversify in terms of region which means another data center to be built in Taiwan. Google has drenched its heavy investments for extended expansion in Singapore that reaches up to $500 million while the new facility in Taiwan will cost up to $600 million. Henceforth, reaching more than a $1 Billion investment mark in Asia. The Singapore facility is expected to be built in two years and will be made online in the same time period. The colorful renditions in the image you see above is shared by Google, which may not be the final version of the facility in Singapore. According to the data centers; vice president at Google states that since the first data center launch, Singaporeans have been increasing in number who came online for the first time reaching out to more than 400,000. At the same time the smartphone penetration rate also rose from 72% to 85%. He also stated that users in Singapore had connection speed more than 100Mbps. Hence, it came as a whim to build new data centers that costed more than a billion dollar. The point of building these facilities is to help Google websites and services to work and load faster for Asian countries. The two sites will play an important role in the provision of faster Google services. However, google also had a third facility in mind which was to be made in Hong Kong. The Hong Kong facility would have been in a working state today if only Google had not abandoned the plan. The data centers do not cater the nearby regions alone. These forthcoming data centers can also cater needs of US and European countries as well and vice versa. However, users who are closer to the facility are benefited from faster loading speeds of Google services. So good news for Asian users as they will be enjoying a considerate increase in Google’s web and service related speed. This is all for Google’s expansion plan, let us know about your thoughts in the comments below. The post Google Pumps More Than $1 Billion to Expand Data Centers In Asia by Ali Salman appeared first on WCCFtech.